Jerry Singleton was born in 1940 in Weatherford, Oklahoma. He was commissioned a 2d Lt through the U.S. Air Force Academy on June 6, 1962, and graduated from Undergraduate Pilot Training and awarded his pilot wings at Webb AFB, Texas, in September 1963. Lt Singleton then completed helicopter training at Stead AFB, Nevada, in April 1964, and was assigned to the 4486th and then the 4488th Test Squadron (later redesignated the 4401st Helicopter Squadron) at Eglin AFB, Florida, where he served from May 1964 to October 1965. He then began flying combat missions in Southeast Asia with the 38th Aerospace Rescue and Recovery Squadron at Udorn Royal Thai AFB, Thailand, and was shot down on November 6, 1965. Singleton evaded the enemy for 5 days before being captured and taken as a Prisoner of War by the North Vietnamese on November 11, 1965. After spending 2,655 days in captivity, he was released during Operation Homecoming on February 12, 1973. 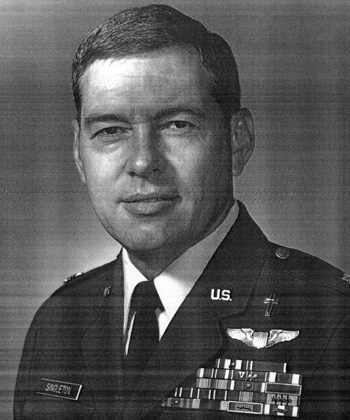 He was briefly hospitalized to recover from his injuries at Sheppard AFB, Texas, and then served as Assistant Staff Judge Advocate for the 7th Combat Support Group at Carswell AFB, Texas, from July 1973 to September 1974, when he attended the Dallas Theological Seminary and became an Air Force Chaplain upon graduation in June 1978. Col Singleton served as a Chaplain at Sheppard AFB Texas from June 1978 to August 1980 and he was the Senior Protestant Chaplain for the 21st Tactical Fighter Wing at Elmendorf AFB, Alaska, until his retirement from the Air Force on October 31, 1985. Jerry has two sons, Richard and John. First Lieutenant Jerry A. Singleton distinguished himself by gallantry in connection with military operations against an opposing armed force as Pilot over North Vietnam on 6 November 1965. 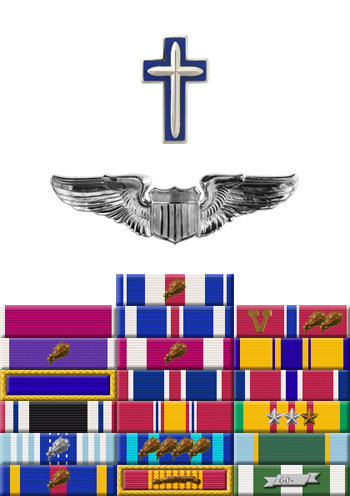 On that date, Lieutenant Singleton displayed an outstanding degree of courage and devotion to duty as he voluntarily flew an unarmed and extremely vulnerable rescue aircraft into a hostile area known to contain numerous concentrations of heavy antiaircraft weapons in a valiant attempt to rescue a downed USAF pilot. As he entered the recovery area, Lieutenant Singleton's aircraft encountered heavy ground fire and burst into flames, causing him and his crew members to bail out over hostile territory. By his gallantry and devotion to duty, Lieutenant Singleton has reflected great credit upon himself and the United States Air Force.